I saw this one coming up over and over on our Instagram feed and finally asked another Instagram friend if it was really as good as everyone was saying. She said it was a "cute" read and worth reading, so I picked it up. Cute is definitely a good word for it. I loved it and definitely recommend it too. Lara Jean Song Covey is a straight arrow. She doesn't do anything bad. She's a great student. She volunteers at the nursing home. Her best friends are her two sisters. They are devoted, good children to their widowed father. With the life she's leading, there isn't much room for upset, and she likes the safe simplicity of her life. So when Peter Kravinsky confronts Lara Jean with a love letter he allegedly received from her, not only is she mortified, her safe and simple life turns completely inside out. Because Peter isn't the only one who received a love letter. 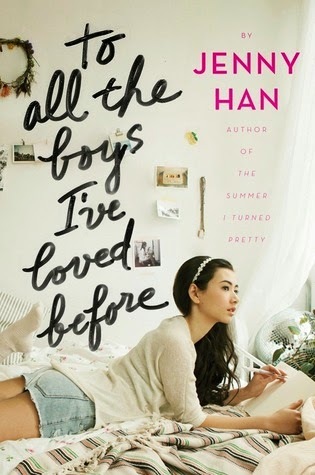 For the five loves she has ever had in her life, Lara Jean has written a love letter. A letter holding nothing back. All she feels and has felt for each particular boy is laid out on the page. After the letter is written, she seals it, addresses it, puts it away in a hatbox in her closet, and lays her love for the boy to rest. Somehow, the letters were sent, and facing Peter isn't the worst of it. Because the boy she is still in love with receives one too. What follows is exactly what I said earlier. A super cute, easy, fun read. Definitely a chick flick in a book. I really enjoyed this read, especially after a couple days of work reading and slogging through books that weren't exactly my choice. The writing is well done, the plot sweet and well laid out, and there were great character arcs. One of my favorite parts of this story was the sister relationship, because anyone who is close with their sisters will just get this book. Han got that SO right. Actually, I felt like all the relationships and the feelings that went with them felt very genuine and authentic. It almost makes me wonder if Han was writing from her own experiences. I was initially disappointed with the end of the book. I felt like nothing was sewn up very well and the one part that I wanted to read about the most was left entirely up to the readers imagination. It felt gimmicky and unsatisfying, which was disappointing after I had enjoyed the book so much. BUT then I found out there is another book coming out this year and it changed my whole view of the ending. ha. Because I realize that Han was allowing for the story to continue on in depth (which is what you really really want) and you realize the ending is actually a great set up for what is to come. Han has grown her characters and the plot to a point where you just know what is to come is going to be great. Okay, so I know that tomato soup isn't exactly a drink, but I figure that since soup IS technically drunk, it works. Lara Jean, Josh, and Margot have a tradition of getting grilled cheese and tomato soup together when they hang out at their favorite diner, and it just seemed like a good fit for this one.